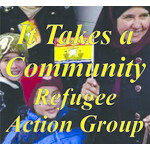 ITC Refugee Action Group hasn't added a story. We are a small group of volunteers, residents of Riverview Park in the east end of Ottawa who want to assist with the Syrian Refugee resettlement initiative. We are supported by our community association. We conducted a survey to test community support, which proved to be very solid and provided us with strong encouragement to proceed. We found a willing partner in Emmanuel United Church, an existing federal government approved sponsorship agreement holder. This makes sponsorship faster and more straightforward. Emmanuel United has identified a Syrian refugee family of seven needing sponsorship - two parents, two brothers, one sister-in-law and two pre-school children. They have fled from Holms and are currently in Beirut, Lebanon in very crowded surroundings with limited resources. A brother, sister-in-law and infant daughter are already residents in Ottawa and eager to help reunite their family. We have launched our fundraising campaign to raise a minimum of $50,000.00 which is the total amount needed to support a family of seven for a full year. Our plan is to raise $15,000.00 through online donations, with the remaining funds donated by our local community. These are minimum amounts. If we raise more money, we will be able to sponsor another family. We (our initial core group) are a group that includes children and grandchildren of immigrants and refugees from Europe and Russia; we are honouring their bravery and sacrifice by paying forward. online; for online donations no charitable donation receipts are issued. Donations will be acknowledged by e-mail. Emmanuel will issue and mail charitable donation receipts close to the next taxation period. Please ensure that your name, mailing address and emai address are on the cheque and are clear and legible. Online donations can be made via PayPal, WePay or credit card; follow the instructions on this site. All donations are non-refundable. In the unlikely event that we do not reach our goal, all money raised will be held in trust by the Church to be used as a donation to another resettlement initiative. We are aware that there are many causes needing and worthy of your support. Thank you for considering the ITC Refugee Action Group. It truly does take a community. You can help spread the reach of our efforts beyond our community. Many of your friends, colleagues, relatives, and other contacts may be motivated to make a contribution, no matter the size, to be part of this Canada-wide initiative. Please send a message to your own networks via e-mail or Facebook or send the donation link to your network via Twitter. Visit our website to watch contributions grow and to get reports on our progress. The more funds we raise, the more families we can provide with a new start in Ottawa. ITC Refugee Action Group hasn't posted any updates yet. ITC Refugee Action Group is managing the funds for this campaign.